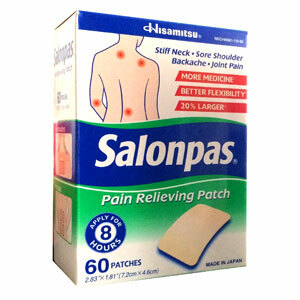 Salonpas is a medicated patch for temporary pain relief – stiff neck, sore shoulders, backache, joint pain. Mineral oil, perfume, polyisobutylene, styrene-isoprene-styrene block copolymer, synthetic aluminum silicate, terpene resin, titanium dioxide. For temporary relief of minor aches and pains of muscles and joints. Arthritis, simple backache, strains, bruises, sprains. Clean and dry the affected area before application. Remove the attached film from medicated plaster and apply adhesive side to the affected area. Adults, apply to affected area not more than 3 times daily for 7 days if needed. Use two or more plasters if necessary to cover the entire area. Remove from skin after at most 8 hours of application. Children under 12 years of age, consult a doctor. For external use only, avoid contact with the eyes. Allergy alert: If prone to allergic reaction from aspirin or salicylates, consult a doctor before use. Do not use on wounds or damaged skin, with a heating pad or if you are allergic to any ingredients of this product. When using this product, use only as directed, avoid contact with the eyes, mucous membranes or rashes, do not bandage tightly. Stop use and ask a doctor if rash, itching or excessive skin irritation develops, conditions worsen, symptoms persist for more than 7 days, symptoms clear up and occur within a few days. If pregnant or breast-feeding, ask a health professional before use. Keep out of reach of children. If swallowed, get medical help or contact a Poison Control Center right away. Avoid storing product in direct sunlight, protect product from excessive moisture. This product is NOT made with natural rubber latex.